This is a most beautiful set of Vibrant Green Emeralds and Colorful Opals all oval cut sized 7x5mm (0.28″x 0.20″), 6x4mm (0.24″x0.16″) and 5x4mm (0.20″x0.16″), all set in this delightful Victorian style setting made completely from High Quality English Sterling Silver. All Genuine Natural Emeralds and Opals. The ring has been extremely well made, follow the ring round and you get a nice thick shank which shows that this is a quality design and is also good for durability and comfort. Whats more there’s a beautiful well crafted carving on the shoulders of the ring that is absolutely gorgeous. Completely Made from Pure Solid Sterling Silver. The inside of the shank of the ring has been stamped by the Assay Office in London. The Assay Office was established in the 1300’s, they test the metal content of articles submitted to them and will only put their mark on items which have the correct metal content, hence this stamp is your independent proof that this ring is made from Solid Sterling Silver. The mark includes 925, the Leopards Head and the Royal Crown.This ring was Designed and Made in England, is available in a wide range of sizes and will be sent to you in a Luxury Presentation ring box. A beautiful English Hallmarked Sterling Silver Ring. This stunning ring has been set with with five Marquise cut 6x3mm (0.24″ x 0.12″) Vibrant olive green Peridots and four 2.5mm (0.1″) High Quality Natural Fiery Opals in this Highly Unusual Eternity Setting. 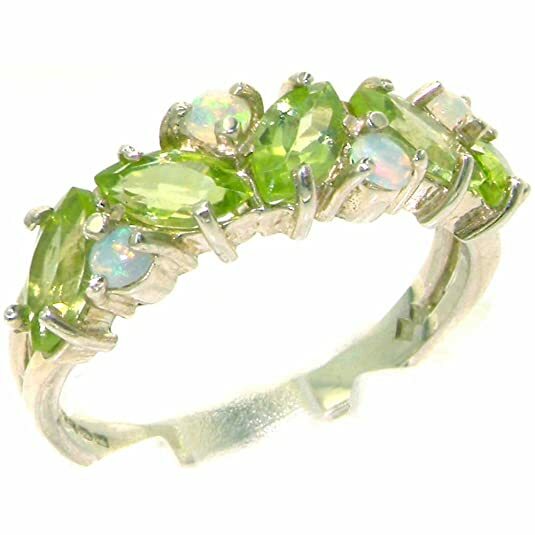 The Sparkle of these Peridots together with the Fiery Colors within these Opals make this a very pretty ring indeed. All the Peridots & Opals are Genuine Natural Gemstones. Due to the arrangement of the gemstones and its slim design, this ring can easily be worn alongside an existing wedding ring if required. It is quite an unusual style for an Eternity ring which makes it a very individual piece of jewelry, it is an exceptionally pretty ring. 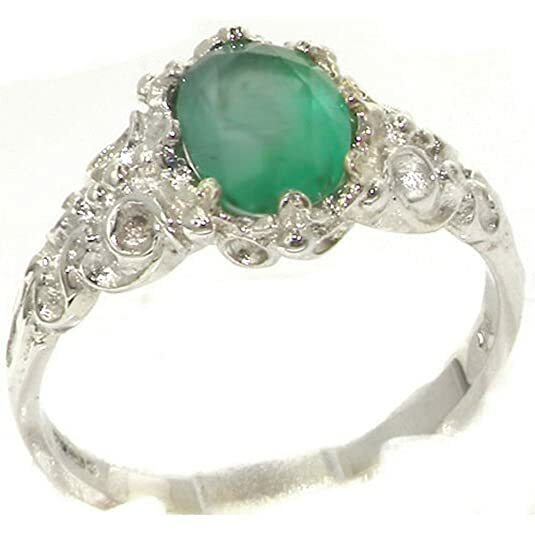 The Quality of this piece is Superb, each Gemstone has been securely claw set by a Master Jeweler, follow the ring round and you have good thick shank which shows that this is a quality design. The ring has been Fully Hallmarked in London, by the London Assay Office – Solid Sterling Silver, the markings include 925 (the symbol for Sterling Silver), the Leopards Head (the symbol for the London Assay Office) and Royal Lion (which confirms their Royal Appointment). 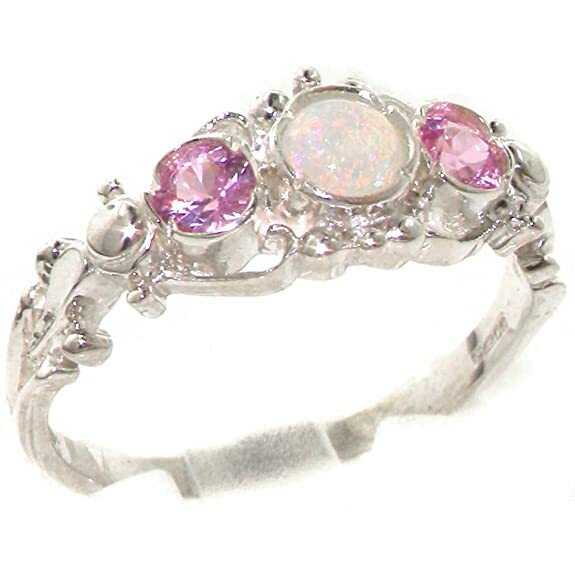 This stunning ring has been set with three round Opal and Pink Tourmalines measuring 4.25mm (0.17″) and 3.5mm (0.14″). They have been hand set into this delightful Trilogy setting the design of which was inspired by the English Georgian period. The Rainbow of colors within this unique colorful Opal Sparkle along side these Vibrant Pink Tourmalines. 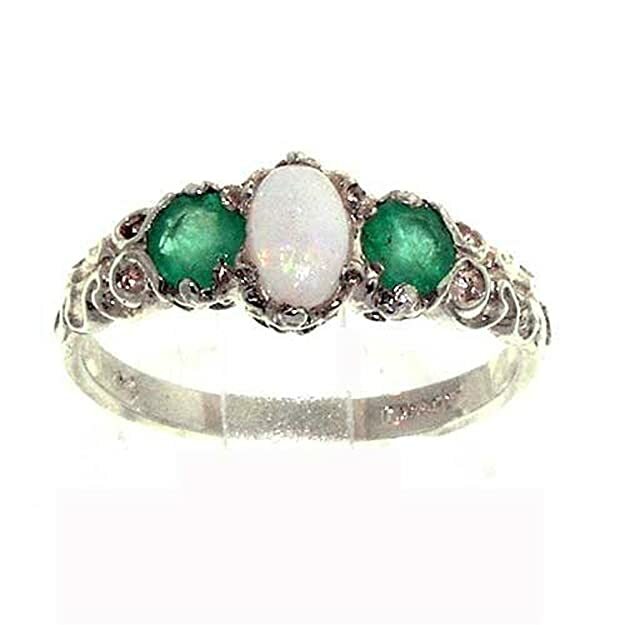 This is such a wonderful ring to wear, comfortable and easy to wear everyday, yet the design and the Gemstones are just so pretty you can’t stop looking at it, as it is certainly an eye-catching piece.These are all Genuine Gemstones, Natural Australian Opal & Natural Pink Tourmalines hand set into Solid Sterling Silver. On the inside of the shank there is a Full British Hallmark which includes 925, the Leopards head and the Royal Lion, only High Quality Solid Silver will have a Full marking such as this.This ring was Designed and Made in England, is available in a wide range of sizes and will be sent to you in a Luxury Presentation ring box. One centre oval cut 6×4 mm (0.24″ x 0.16″) & two Brilliant cut 4mm (0.16″) Vibrant Ice Blue Aquamarines set in this Solid Sterling Silver Victorian style setting.The inside of the shank has a marking, this is a Full Hallmark made by the London Assay Office in England This mark includes 925, the Leopards Head and the Royal Lion. This is your independent proof and guarantee that the ring has been completely made from Solid Sterling Silver.This is a delightful piece to wear, comfortable and easy to wear everyday, large enough to be noticed but not overpowering, . A lovely dainty ring set with a centre 6x4mm (0.24″ x 0.16″) colourful fiery Opal and two 4mm (0.16″) vibrant Emeralds with a gorgeous carving on the shoulders. A perfect fit for any finger.. 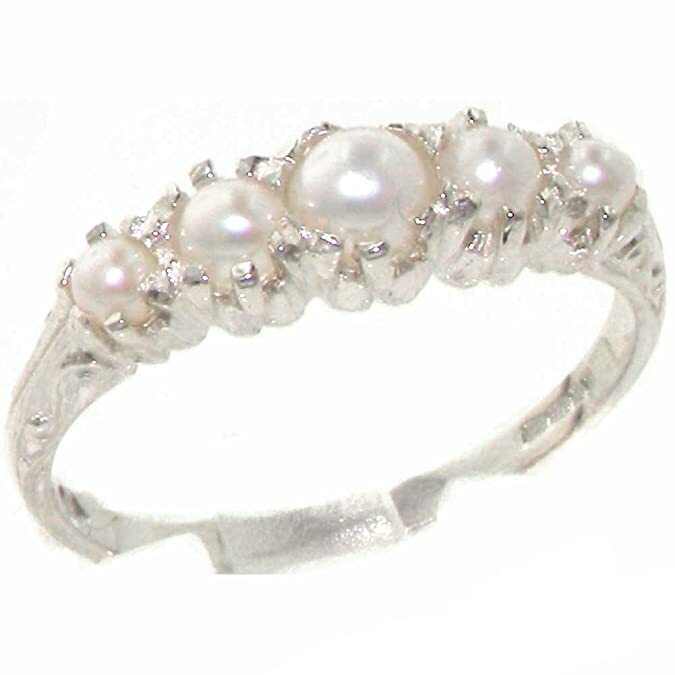 This Delightful ring has been hand set with a beautiful selection of round Cultured Pearls. A beautifull ring of a Vintage Design, comfortable and easy to wear.These are Genuine Natural Freshwater Cultured Pearls.The Silver is Solid Sterling Silver authenticated by the Assay Office in London, England. They have stamped their mark on the inside of the shank to confirm that this ring is made of Solid 925 Sterling Silver. This mark is unique to the Assay Office in London and will only be found on High Quality Silver articles.This ring was Designed and Made in England, is available in a wide range of sizes and will be sent to you in a Luxury Presentation ring box. This stunning ring has been set with a solitaire Fabulous Emerald measuring 8x6mm (0.32″ x 0.24″ inches) which has a deep color and great clarity and looks so elegant set against the Sterling Silver. The Emerald has been hand set in this luxury Solid Sterling Silver Solitaire setting with a beautiful English Carving on the shoulders of the ring. The Quality of this piece is Superb, the Emerald has been selected and claw set by a Master Jeweller. The ring has a good thick Solid shank which shows that this is a quality design and is also good for comfort and durability. This is a Genuine Natural Emerald. Completely Solid Sterling Silver – on the inside of the shank there is a Full British Hallmark which includes 925, the Leopards head and the Royal Crown. 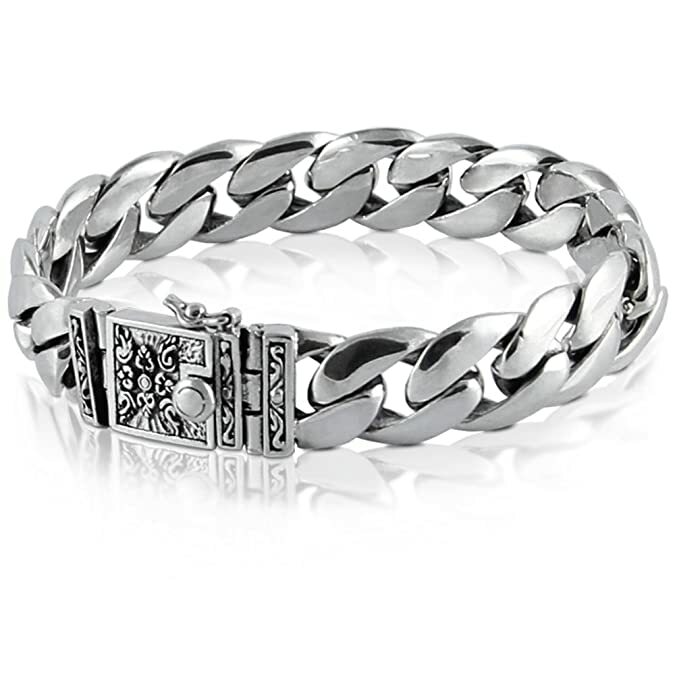 High Class 925 Sterling Silver Men Chain BraceletThe quality and excellent design of this bracelet can be seen immediately when you open the package, as soon as you wear the bracelet you will feel the comforting and pleasant touch of the heavy metal, with no time your hand and the bracelet will be together as one. This stunning ring has been set with a large 6x4mm (0.24″ x 0.16″) Opal and two Rubies on the shoulders measuring 2.25mm (0.09″). 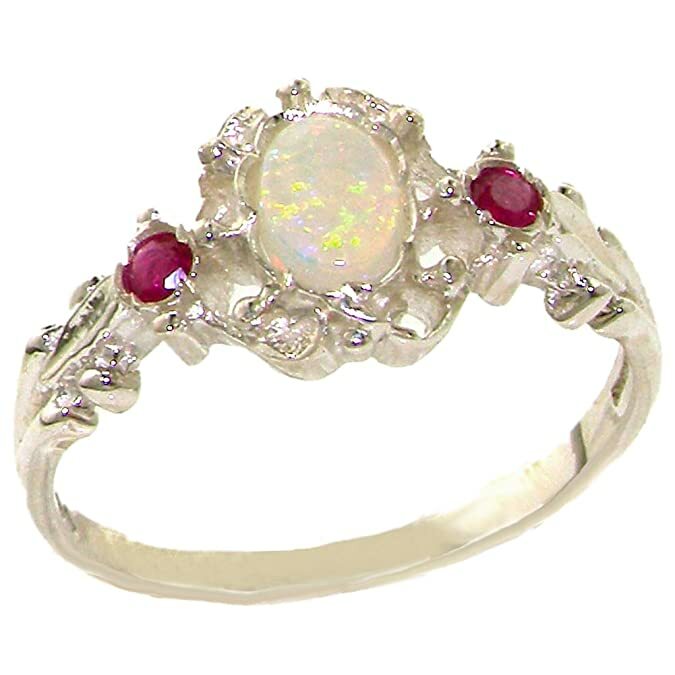 The contrast of the Sparkling rainbow of colors within the Opal with these Vibrant red Rubies set within this delicate yet strong setting, creates such an elegant look and feel, this ring is certainly a very special piece. 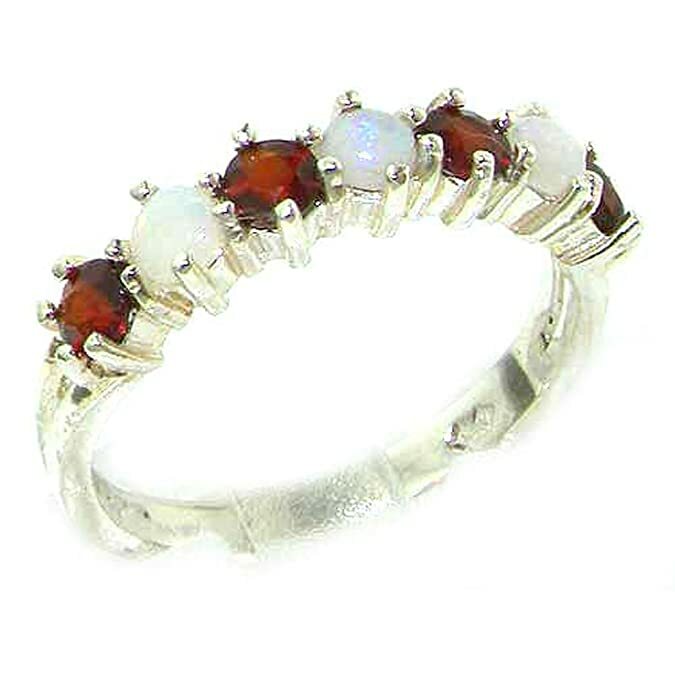 The design is such that it has a dainty appearance yet these colorful gems are just so eye-catching, therefore it is a beautiful ring to wear, comfortable, noticeable yet not overpowering.These are all Genuine Gemstones, Natural Australian Opal and Natural Rubies hand set into Solid Sterling Silver. On the inside of the shank there is a Full British Hallmark which includes 925, the Leopards head and the Royal Lion, only High Quality Solid Silver will have a Full marking such as this.This ring was Designed and Made in England, is available in a wide range of sizes and will be sent to you in a Luxury Presentation ring box. Five round Vibrant Green Emeralds and Satin Cultured Pearls measuring 4 mm, 3 mm & 2.75 mm set in a Solid English 925 Sterling Silver Antique style setting. Made completely from Solid English 925 Sterling Silver – on the inside of the shank there is a Full British Hallmark which includes 925, the Leopards head and the Royal Crown, this confirms the rings authenticity. There is a Beautiful unusual carving on the shoulders of this ring which add to the individuality of this piece. Follow the ring round and you have a good thick shank as you would expect from such a high quality piece. 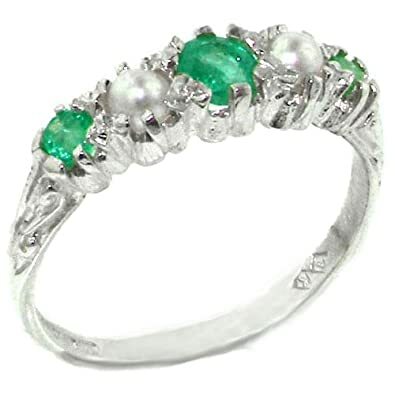 These are Genuine Emeralds & Cultured Pearls which are very attractive to look at and to wear. 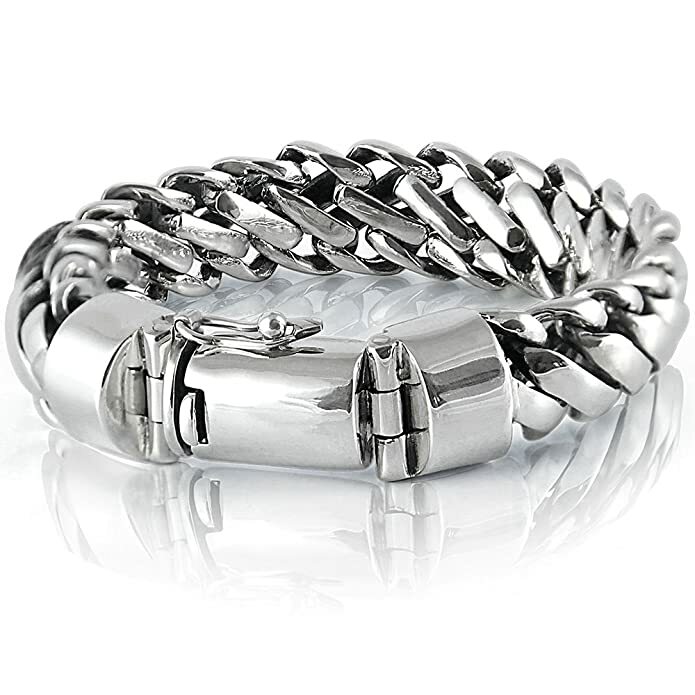 Round Snake 925 Sterling Silver Heavy Men BraceletThe quality and excellent design of this bracelet can be seen immediately when you open the package, as soon as you wear the bracelet you will feel the comforting and pleasant touch of the heavy metal, with no time your hand and the bracelet will be together as one. These High Quality Opals have a Beautiful play of Fiery Colors enhanced by these Vibrant Deep Red Garnets. Three Opals & four Garnets equally sized measuring approx 3mm (0.12″) round have been hand set in this Sterling Silver Eternity setting. These are Solid Genuine Australian Opals and Natural Garnets. Made completely from Solid English Sterling Silver. This ring has been Fully Hallmarked by the London Assay Office. These markings include, the Royal Lion, 925 and the Leopards Head, being the symbol of the Assay Office. I can not say enough about how lovely this ring is, it looks fantastic especially when worn, the craftmanship is of an extremely high standard and it is a very easy and comfortable ring to wear . This stunning ring has been set with Five round Vibrant Emeralds and Cultured Pearls measuring 4mm (0.16″) and 3.25mm (0.13″). 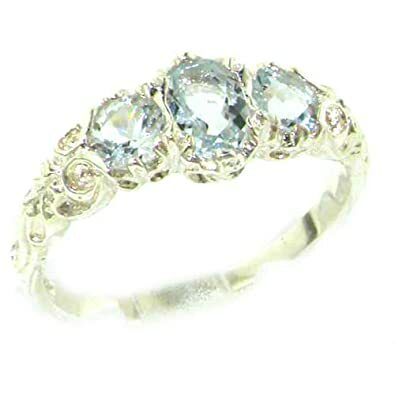 They have been hand set into this delightful Victorian style ring which has a reassuringly substantial look and feel. The scroll work detailing makes this such an interesting and individual piece of jewlry.These Vibrant Green Emeralds are the perfect partners for these exotic glowing Cultured Pearls and create such an elegant look set within the Polished Silver. 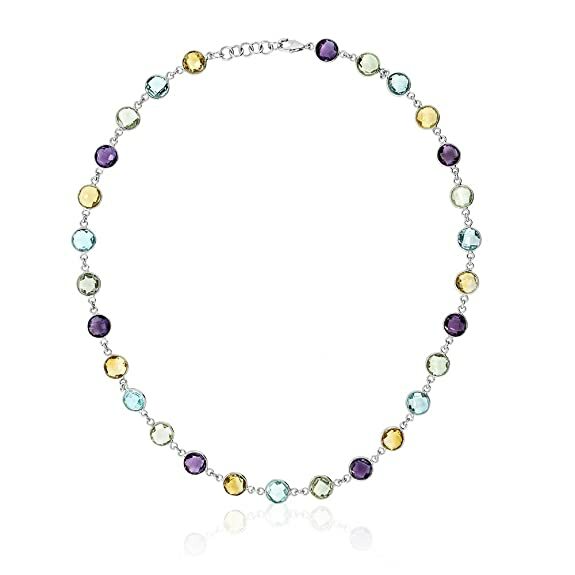 These are all Genuine Gems, natural Emeralds and Freshwater Cultured Pearls hand set into Solid Sterling Silver. On the inside of the shank there is a Full British Hallmark which includes 925, the Leopards head and the Royal Lion, only High Quality Solid Silver will have a Full marking such as this.This ring was Designed and Made in England, is available in a wide range of sizes and will be sent to you in a Luxury Presentation ring box. 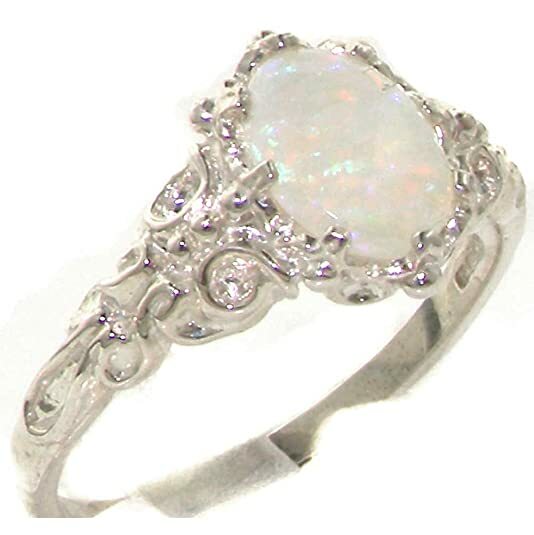 This stunning ring has been set with a solitaire Fabulous colorful Opal measuring 8x6mm (0.32″ x 0.24″ inches) which has a nice fire and looks so elegant set against the Sterling Silver. The Opal has been hand set in this Solid Sterling Silver Solitaire setting with a beautiful English Carving on the shoulders of the ring. 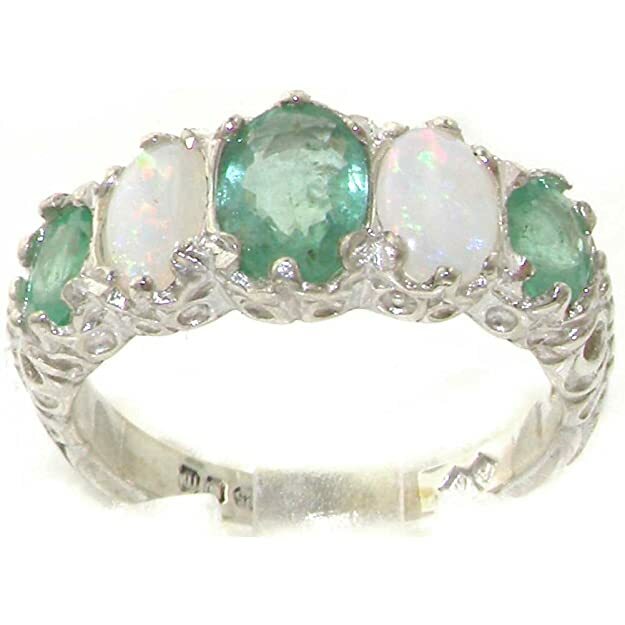 The Quality of this piece is Superb, the Opal has been selected and claw set by a Master Jeweller. The ring has a good thick Solid shank which shows that this is a quality design and is also good for comfort and durability. This is a Genuine Natural Opal. Completely Solid Sterling Silver – on the inside of the shank there is a Full British Hallmark which includes 925, the Leopards head and the Royal Crown.